Since communications between the Hiroshima and higher military and naval headquarters had been severed, initial news that something frightful had occurred at Hiroshima came into Tokyo from nearby towns. People reported to the navy's underground headquarters in Tokyo a "sinister cloud," an "enormous explosion," a "terrible flash," a "heavy roar." Reports were vague and created more puzzlement than alarm. Finally, from descriptions of the city's destruction, Japanese military began to realize that what happened may have been the result of an atomic bomb-a shock to them, since most thought the Americans' progress in nuclear bomb development to be still in the "scientific investigation" stage. "Sixteen hours ago an American airplane dropped one bomb on Hiroshima. It is an atomic bomb. We are now prepared to obliterate more rapidly and completely every productive enterprise the Japanese have above ground in any city. If they do not now accept our terms they may expect a rain of ruin from the air the like of which has never been seen on this earth." The Japanese immediately formed the "Atomic Bomb Countermeasure Committee," which was made up of members of the War, Navy, and Home ministries, and included Technical Board representatives. The committee's first meeting was held on August 7, at which time the latter group "strongly insisted that the bomb was not an atomic bomb." They maintained that even if the Americans had gone so far as to develop an atomic bomb, they wouldn't have brought "such unstable weapons as atomic devices to Japan, across the Pacific." They added, "We do not know what will happen in the future, but to date American technique is not that highly developed." Rather, they claimed, the explosion was the result of a "new type [of] bomb with special equipment, but its content is unknown." Japan's initial public announcement of the bomb did not include the word "atomic." In the meantime, army and navy personnel had been sent to investigate Hiroshima. 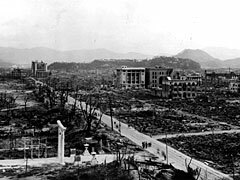 Initially, there was disbelief that the destruction was caused by an atomic bomb, but after viewing the degree and nature of the devastation and noting that it was different from that caused by conventional bombs, they knew that the United States had indeed perfected and used the atomic bomb. Japan was quite a bit behind in its own nuclear-bomb development.